Belligerents in Yemen’s civil war are no longer prioritizing the pursuit of a political resolution to the conflict. Six years after the Gulf Cooperation Council’s initiative to ensure a peaceful political transfer of a stable central government on November 23, 2011, Yemen has fractured and is now the world’s worst humanitarian crisis. 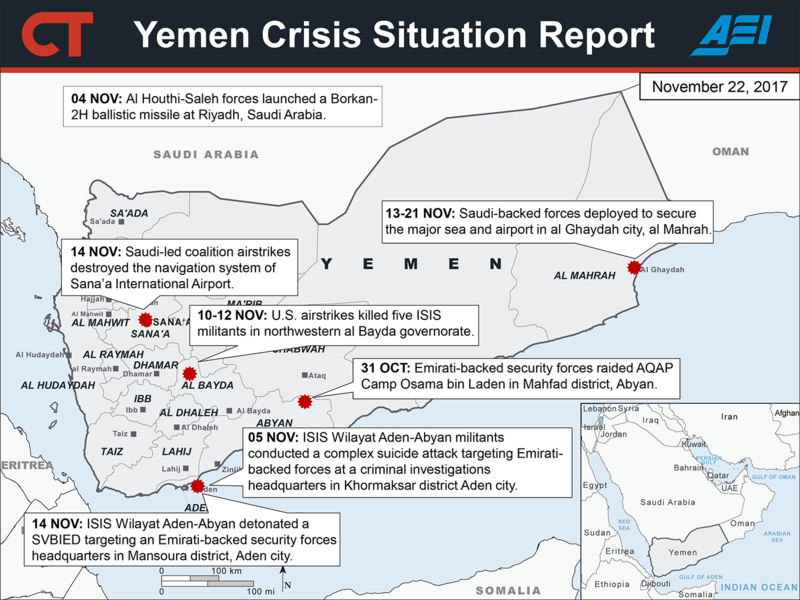 Yemen is a key battlefield for the Iranian-Saudi regional conflict. The al Houthi-Saleh bloc launched a missile at Saudi Arabia’s capital, Riyadh, on November 4 after news broke from the city that Saudi-supported Lebanese Prime Minister Saad Hariri had resigned in protest of Hezbollah’s influence in Lebanon. It is not clear whether Hariri’s resignation directly influenced the decision to attack. Iran established an early pattern of antagonizing Saudi Arabia through Yemen. The al Houthi-Saleh bloc’s use of long-range ballistic missiles and other asymmetrical attack capabilities have coincided with other Saudi anti-Iranian actions. Iran continues to press the issue. Iranian Foreign Minister Mohammad Javad Zarif urged the UN to adopt his 2015 Yemen peace plan in mid-November, following the ballistic missile launch. The Saudi-led coalition’s blockade of Yemen does not significantly limit the threat of Iranian-facilitated long-range ballistic missile attacks on Saudi Arabia and could also strengthen the al Houthi-Saleh bloc through its ties to the Yemeni black market. The al Houthi-Saleh bloc views its ballistic missile capability, which almost certainly includes additional reserves, as a core defense against Saudi Arabia and could still attempt additional attacks. The Saudi-led coalition closed Yemen’s air and sea ports on November 5 in reaction to the November 4 ballistic missile strike. The blockade will not shut down overland smuggling from eastern Yemen and Oman, an identified route for the transfer of missile parts from Iran to the al Houthi-Saleh bloc. The 123rd Yemeni Armored Bridged mobilized to secure al Ghaydah’s sea and airport in al Mahrah governorate, eastern Yemen in mid-November, which may have a greater impact on Iranian smuggling than the blockade. Additionally, the cost of basic goods skyrocketed since the coalition implemented its more stringent blockade, also driving up prices on the black market. Stakeholders on both sides of the conflict critical to a resolution are profiting from the illicit economy and lack incentives to genuinely engage in the political process. The independence efforts of the Emirati-backed Transitional Political Council of the South (STC) further complicate the resolution of the political crisis in Yemen. The STC, a political body established in May 2017 that contests the legitimacy of the Hadi government, finished establishing local government offices in all southern and eastern governorates except Socotra on November 20. It has not yet presented a clear plan of how or if these offices will coordinate with pre-existing local governmental structures. Additionally, the STC lacks significant support in parts of eastern Yemen, which hinders its ability to act as a representative for the populations it plans to govern. The STC has become a vector for Emirati backing in southern and eastern Yemen that empowers certain local factions and that could destabilize the area politically. The internationally recognized Hadi government is forming a rival political southern coalition in an attempt to counter the STC. Competition among Gulf States for influence in the country may destabilize southern Yemen. Al Mahrah, Yemen’s eastern most governorate along the Omani border, has historically been under Oman’s sphere of influence. The UAE, through the STC, is attempting to project its influence into al Mahrah, though the STC does not have significant support in the governorate. Reported Saudi-backed forces also deployed to al Mahrah’s air and sea port after local forces conditionally granted them access in mid-November. This deployment may generate instability because some of the tribes’ livelihoods depend on the smuggling trade. Additionally, Emirati-backed and Saudi-backed forces have periodically clashed in Aden city, the government’s interim capital, on several occasions. The Islamic State of Iraq and al Sham (ISIS) retains a small presence in central and possibly southern Yemen. ISIS Wilayat Aden-Abyan conducted two explosive suicide attacks targeting UAE-backed forces in Aden city in November, the group’s first attacks in southern Yemen since January 2017. The attacks followed a series of U.S. airstrikes targeting ISIS camps and personnel in al Bayda governorate in central Yemen in October and November. ISIS also resumed attacks in al Bayda following the airstrikes after two months of inactivity in the area. ISIS began releasing videos and images of its training camps in the fall to signal its re-emergence. The recent attacks in Aden may have been a show of strength after the recent U.S. and Emirati counter-terrorism operations against the group. Emirati-backed security forces had dismantled ISIS’s southern cells in late 2016 and early 2017. A political resolution to the Yemeni conflict remains unlikely. The war economy and Saudi Arabia’s reactionary policies are preserving conditions that incentivize local actors to perpetuating the war. The U.S. must work to change incentive structures in Yemen and the region to bring crucial actors to negotiations. The protracted civil war harms the credibility of the U.S. internationally as the U.S. is increasingly blamed for inaction as the world’s worst humanitarian crisis continues to spiral. Emma Tveit and Miranda Morton contributed significant research to this situation report.